>> View a video about UTSA's Carnegie Foundation designation. (Jan. 7, 2015) -- The Carnegie Foundation for the Advancement of Teaching has selected The University of Texas at San Antonio (UTSA) to receive its prestigious Community Engagement Classification, recognizing the university's commitment to serving the local community. The honor acknowledges UTSA's "dynamic and noteworthy" community outreach efforts in San Antonio and its impact on the global community through teaching and research, public service, volunteerism, civic partnerships and economic development. UTSA is among 83 universities in the United States to receive the designation for the first time and among an elite group of only 361 campuses to gain the designation since the foundation began recognizing community engagement achievements in 2006. There are more than 4,700 colleges and universities in the United States. "The Carnegie designation speaks to our commitment to community outreach and our drive to make a difference in the lives of our students and our community," said UTSA President Ricardo Romo. "It is a remarkable milestone for the university and another advancement in our journey to Tier One recognition." Community engagement is defined by the Carnegie Foundation as collaboration between a university and the community that enriches scholarship and research, spurs creativity, addresses pressing social issues and prepares students to be educated, engaged citizens who value civic responsibility. The Carnegie Foundation awarded the designation based on a university-wide evaluation that documented UTSA's extensive community engagement efforts, including its $1.2 billion annual impact on the local economy, support of almost 16,000 jobs, numerous public service and volunteer programs, leadership in San Antonio area public schools and outreach to Hispanic, military and underserved communities. "UTSA students and graduates have been critical to San Antonio's economic and community development," said San Antonio Mayor Ivy Taylor. "They start businesses, teach in our schools, volunteer in all manner of civic projects, enrich our workforce and become the next generation of leaders. UTSA is an outstanding model for how educational institutions can engage with their communities." In addition to serving as mayor, Taylor is a lecturer in the UTSA College of Public Policy. "We are an engaged university. It is part of our DNA," said Jude Valdez, UTSA vice president for community services. "Since UTSA was first established, we have been deeply connected to our region and our community." The Carnegie Foundation selects colleges and universities for the Community Engagement Classification every five years. To be considered, UTSA submitted extensive documentation of mission statements, strategic plans, budgets infrastructure and impact on the community. "Your application documented excellent alignment among campus mission, culture, leadership, resources and practices that support dynamic and noteworthy community engagement," the Carnegie Foundation said of the UTSA application. "UTSA is connected to our community in so many ways. The teaching excellence, the research, the volunteer work that professors as well as students do -- that all adds up to a tremendous benefit," said Bexar County Judge Nelson Wolff. "We're really proud of UTSA. It's on the road to becoming Tier One." 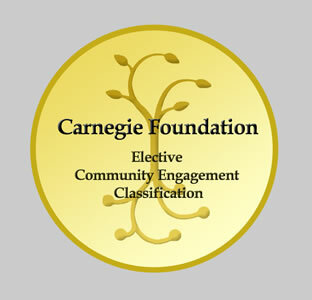 The Carnegie Community Engagement Classification is valid for 10 years. Learn more at UTSA's Carnegie Community Engagement Classification website.